We’d love your help. Let us know what’s wrong with this preview of Dreaming in Libro by Louise Bernikow. To ask other readers questions about Dreaming in Libro, please sign up. This is not a typical book I'd read. It came to me from a friend, and I read it. It is about a woman who takes in a stray dog in NYC, and how the dog changes her life. It's different for sure. It contains totally in appropriate thoughts, words, and activities in it, for a Christian minded, God fearing woman. I'd not recommend this book at all. Yikes. The greatest book of all time. Of all time! Man does not live by bread alone, but a writing woman needs a dog. Especially, for me and for this writer, a boxer. Recommends it for: cold, cold people who like to laugh at others? I read this for work, and am only putting it on my goodreads to warn the rest of you; the narrator does draw you close into her world, but, honestly, you probably don't want to be there. If you're looking for a cool (and moving) personal-non-fiction-with-a-dog-attached book, read "Travels With Charley" by John Steinbeck. What an emotional story about the writer and her unexpected companion, Libro. The cover caught my eye at the library, due to the very handsome boxer (I myself had one, Trevor) on it. This was a very fast read; funny, sad, and lovely. Being a dog lover, I relate to most books that tell the story of human-canine partnerships. This book was no exception, and the dog in question sounds like he was exceptional too. However the book as a whole was not an exceptional IMHO. The way Louise Bernikow writes made this an enjoyable read. She is a non-doggy person who suddenly adopts a young boxer. Her descriptions of how Libro helped her to become a better person and their adventures together were almost musical. Follow on book to Bark If You Love me. 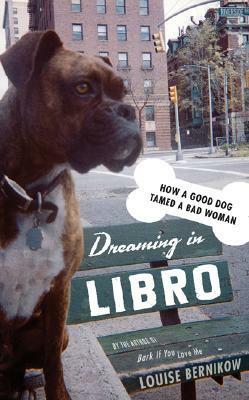 Author, a single NY city woman finds and inexplicably adopts a stray boxer. Her adventures with the NY dog culture, the love of a dog, and (or course) a sad ending. Spoiler: all dog book series end sadly. Dogs do not live as long as humans. Wonderful and well written account of a woman and her dog. It was very funny how she takes you through the stages of this dog's life. I loved this memoir. I could relate to many parts of the story, especially when she described communicating to Libro without words. Just an account of the author taking her dog on book signings and nothing would happen. Very boring. I saw nothing of "How a good dog tamed a bad woman." What a read!?! For anyone who loves dogs, especially rescued dogs, this is for you. I related to EVERYTHING in this book. Sobbed through the second half. Loved it, loved it, loved it. curling up with this book feels a bit like curling up with a favorite pet - comforting. I read this book and Bark If you love me in record time. The author is fluid, funny, and real. Great book for dog folks! The story of how a rescued dog changed a woman's life for the better. I've read better written books about the same subject but if you can't get enough of this kind of thing, you'll enjoy this book. Wonderfully written book, will make you laugh and cry. A must read for all dog people.